Dubai: Some believe it is common for men hovering around the 40-year-old mark to experience a mid-life crisis. However, for one man turning 40 is just another reason to do something spectacular and inspire a nation's youth while he is at it. In January, Scott Ragsdale, chairman of the naseba group, celebrated his 40th birthday and on December 2 the UAE will celebrate its 40th National Day. In commemoration of National Day and with endorsement from the UAE General Authority of Youth and Sports Welfare, Ragsdale is taking on this challenging feat. 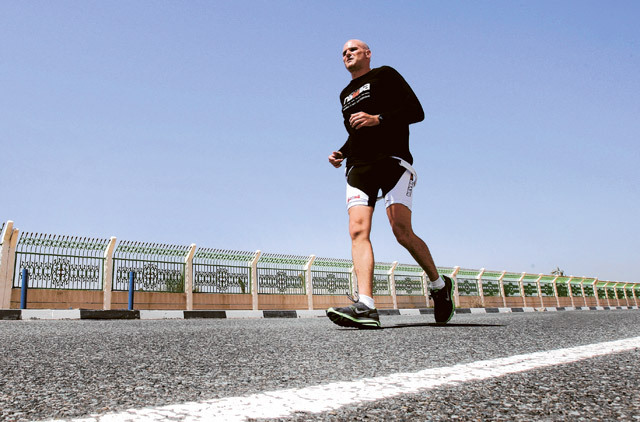 On November 28, he will begin the naseba-seven challenge; commonly known as a seven-day Ironman Triathlon. On December 5, he will arrive in Abu Dhabi, having finished his quest of swimming 3.5 kilometres, cycling 180.25 kilometres and running 42.195 kilometres, alone, every day for a week across the seven emirates. "I want to prove to myself I can be consistent and focused to make this happen and ideally through my actions I will inspire those around me," said Ragsdale. "This isn't anything other than I turned 40 this year and I want to spend a year to focus on getting myself physically fit and making it happen." The Dubai resident is not only a businessman but a husband and a father of two girls aged 16 and seven. He is also fixated on the notion of time wasting, something he thinks the youth of today have mastered. "People are wasting their lives on Facebook…but how can you inspire someone that doesn't want to be inspired," he said. "How do you inspire a spoiled 16-year-old kid in the UAE who doesn't have to worry about anything?" A question for which Ragsdale has no answer but instead a proposal for a solution. "I am a big believer in leading by example and am trying to do that through this initiative," he said "[And] if I can inspire the nation and its youth in the process I'd be very proud." As a former youth competitive swimmer who gave up on his talent, Ragsdale is now determined to live his life to the fullest and have no regrets. "I don't want to be one of those people that should have and could have but didn't...the world is full of those people." Born and raised in America, Ragsdale's proudest achievement in life is travelling to 90 countries and living in 13. His travels continue. No matter what his travel schedule, he makes it fit around his training plan laid out by 47 time ironman finisher, coach Mario Huys. Ragsdale has been training for his challenge since February and will continue to build upon his daily five-hour exercise regime until the end of November when his challenge begins. At present, he wakes up at 3am — when most teenagers are just nodding off —to swim, cycle and run his way to success, as failure is not an option. "I have a great coach who has outlined a plan, which if I stick to and stay focused on, makes me confident I can finish," said Ragsdale. "I will only fail if I don't focus on my training." However, hard work and strenuous exercises are a part of him. Having successfully completed two ironman challenges in New Zealand and France, and being one of the few Americans to swim the English Channel, Ragsdale knows what he is in for. "It's a great challenge to see if I can put myself in a position where I am focused enough and consistent enough with everything in my life to put in the training and make it happen." The athletic businessman maintains he is not a pro-athlete, but a man wishing to soar to great heights both metaphorically and literally. Having already summited Mount Kilimanjaro, Ragsdale hopes to climb Everest one day, but it looks like for now his sights are set on the road ahead. "There will be people out there who will think this is silly and will have no interest," he said. "Then there will be people out there who will think, if this guy is doing something like that then why can't I?" What is the ironman triathlon challenge? The Ironman Triathlon is organised by the World Triathlon Corporation and consists of a 3.86 kilometre swim, a 180.25 kilometre cycling and a 42.195 kilometre marathon run. The challenge must be completed in that order without a break and has a time limit of 17 hours for completion. Scott Ragsdale aims to complete his naseba-seven challenge across each emirate in 14 hours or less.